Blizzcon 2012, Here I come….errr waitaminute!!! 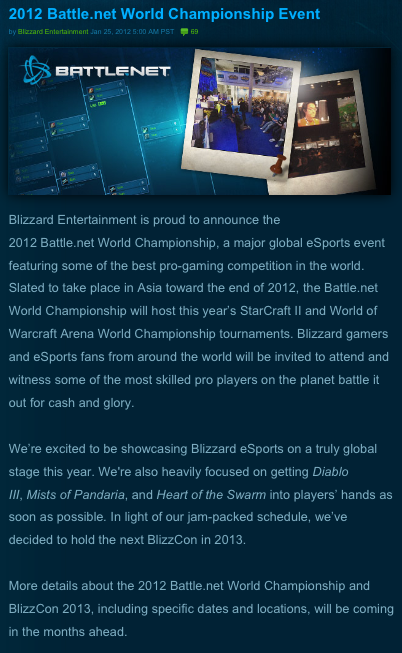 So, no Blizzcon 2012 eh? So, right there you’re thinking…SO! That was on tap long before 2012, plan ahead dammit, and they’ve had game launches even multiple and still had a Blizzcon. WTF?! Yes, but look at those three titles a little more closely. Diablo 3: Long anticipated follow up. Final tweaks and revisions going on now. A MUST home-run on this title. Starcraft 2: Heart of the Swarm: Now, I am anticipating this won’t actually launch in 2012 but rather in 2013..however timing wise 2012 would make more sense. Wings is getting long in the tooth already for the gaming community. Swarm has been teased enough to this point. Again, it HAS to be a home-run. It cannot miss. World of Warcraft: Mists of Pandaria: The supposed LAST expansion for WoW. I say supposed only because if…IF…the next gen MMO is not ready for any kind of release, Blizzard will want WoW to have longer legs. So expect at least the possibility of one more expansion to be the back up plan. Additionally, its still possible that Project Titan is in fact the next gen MMO and next gen WoW all in one…WoW 2.0 if you will. Point blank…MoP CANNOT be a failure. If its the last Xpac, then it must leave a good taste in the community’s mouth. If it is not the last one, it must keep players interested a little longer until their next gen is ready for the world. Now this is enough for them to really want to hunker down and focus on game development and release. No distractions, cancel all vacations and leave, call in the reserves!!! However, there is another consideration here…Blizzard is a business folks. Conventions, Demos, and Symposiums like Blizzcon are all about one thing…driving revenue shares. I.E. MAKE MORE MONEY. Corporations use these things to create buzz about their products usually enhancements or new releases. Assuming the above three titles launch before or near October 2012, they will not be on the table for discussion and stir. Starcraft 2: Operation Protoss, Diablo 4…too far out for any kind of buzz. Only one thing left to talk about, thats right….Titan. So, what is Titan? We have no clue. Blizzard is more tight lipped about Titan than Romney was about his tax bracket!! How far out is Titan, well up until today I would have said no idea…but this tells me one thing: YEARS. I suspect Blizzcon 2013 will be all about Titan, what ever it is. There will be a nostalgia component about the “retirement of World of Warcraft” and what its future holds (because believe me…they will NOT let a franchise this successful just fade to nothing), the Protoss expansion of SC2 will be previewed and discussed, the ongoing enhancements to D3 (assuming there are any – which I gather there would be), and finally the showcase of Titan. So will it be worth the wait?